Let's talk a moment about tradition. When you think about rites of passage, culture, holidays and even religious events, almost guaranteed you are going to think of some sort of food or drink which accompanies it. In New Orleans, the town celebrates food traditions on a daily basis. Perhaps it's just me being a foodie tourist, but when it comes to food pride, New Orleans has it. Jess, my NOLA tour guide along with my hubby Mark and two friends, Tyler and Evangeline, we were able to experience New Orleans, including Jazzfest for 5 days. To begin, we went to a "must" stop in the French Quarter that we had to experience, the 24-hour cafe called Cafe Du Monde for a cup of coffee and the famous beignets covered in powdered sugar. Not just a little bit either- we're talking buried in powdered sugar! The busy waitresses' black skirts don't stand a chance on staying black as white hand prints and streaks of white powdered sugar accent each waitress like flare on a uniform. So much powdered sugar in fact, apparently sources say very early in the morning as they spray down the outside dining area, powdered sugar rises up in plumes. 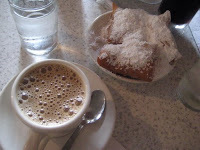 The chicory coffee, the airy beignets (think of the softest donut ever and not overly sweet) and the outdoor dining area, complete with pigeons and clip clopping horse drawn carriages and you have Cafe Du Monde. The weather was wonderfully warm, high 70's and 8o's and not yet crazy humid. The colorful buildings in the French Quarter were ornately decorated in lovely iron work and many of them showered in flowers. Another local spot we had to stop at was called Coop's. They serve traditional N'awlins food from Jambalaya to Po'boys. We ordered a shrimp and an oyster Po'boy on French rolls- "dressed." (meaning- the works!) As you can see from the photos, the portions were not small. Huge crispy gulf shrimp and fried oysters on soft rolls, a bit of mayo, sliced tomato, splash of hot sauce and iceberg lettuce. We washed it down with a “Fleur-de-lis Restoration Ale” by New Orlean's own Abita Brewery. For each restoration beer purchased, $1 goes to restoration post-Katrina efforts. Refreshing, not too heavy and the perfect compliment to the delicious Po'boys. Keep your eyes peeled for the Northwest Oyster Po'boy in Eat and Drink in the Northwest book 2!